Living on the edge of heaven and earth, bringing hope to all with the love and power of Jesus. Our Mission at The Edge is to create a family of Christ-followers that encounter the love and presence of God. We desire to partner with Jesus to experience a community of disciples filled with faith, hope and love, producing lives full of the power of the Holy Spirit to extend His Kingdom to all people. We Value Presence. “I will be with you” is a promise made by God to all His kids! Here at The Edge we desire to be an environment that attracts & hosts the presence of God! Those who discover the value of His presence enter realms of intimacy with God never previously considered possible. We Value the Power of the Holy Spirit. The third person of the Trinity, the Holy Spirit, was sent to dwell in the hearts of believers & point us to Jesus Christ. His power in and through us transforms lives, heals the sick, breaks down walls and reveals the love of the Father. We Value the Word of God. God’s word is living and active, bringing renewal to hearts and minds. The Word is also Jesus (John 1) and as His followers we value knowing Him and His ways, which is done through encountering the Holy Scriptures. We find our moral compass and our Father’s heart by knowing and growing in His Word. We Value Sonship. Those who believe in Jesus are given the right to become the children of God. As His sons and daughters we are no longer orphans and have great value. We Value Relationship. The government of heaven is built on family and relationship. Jesus ushered in this government, which we call the kingdom of God. We Value Church as a Team. We value Christ in YOU, the hope of glory! With that in mind, we know you have much to offer. Together we form Christ’s body, which has many parts. As His body, we will do what He has asked us as a team, in unity and love, to do. We Value Continual Growth. Becoming like Christ is a process, a journey. Therefore, we need to be continually growing in our relationship with God and others both spiritually and in character until we all come to the unity of faith and become like Him. Click here to see a full explanation of our Core Values! The Foursquare Church exists to glorify God and advance His kingdom. Jesus Christ’s command is to preach the gospel and make disciples of all nations (Mark 16:15; Matthew 28:19). Therefore, we are “Dedicated unto the cause of inter-denominational and worldwide evangelism.” These words express our spirit and our focus. 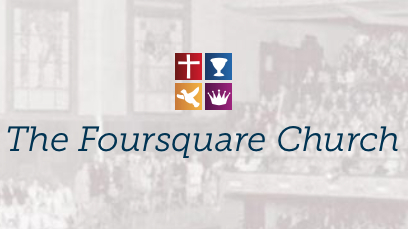 “Foursquare” is a Biblical term used of the tabernacle in the Book of Exodus, of the Temple of the Lord in Ezekiel 40:47, and of Heaven, as described in the book of the Revelation.